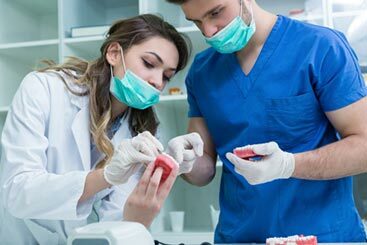 Dental crowns are a restorative dentistry procedure that involves a severely damaged or decayed tooth being completely covered and protected with a hard, white tooth “cap.” These strong tooth crowns are made of a very durable ceramic material that allows for the recreation of the look and anatomy of a natural tooth. Thanks to this advanced dental technology, our team at Constitution Dental in Downtown Ottawa can restore patients’ decayed or damaged teeth, leaving them with a beautiful white smile that looks and feels perfectly natural! Durable — Dental crowns are incredibly strong ceramic caps that are placed over damaged or decayed teeth, which shield them from further damage and are made to last for years to come. Protection — Dental crowns offer long-lasting protection for damaged teeth so they do not continue to decay or require future extraction. Aesthetics — Dental crowns are ceramic teeth crowns that look like natural, white teeth. Functionality — Dental crowns are strong, durable, and therefore function like a completely natural tooth. Wondering if dental crowns are right for you? Give us a call today or request an appointment online at Constitution Dental in Downtown Ottawa to meet with our dentists and discuss the best plan of action for your unique needs. We would be happy to determine the right restorative dentistry procedure for you so we can save, strengthen, and protect your natural teeth!